URBANA, Ill. – Investors and executives in the agricultural industry are getting a first look at TerraSentia, a new-to-the-market agricultural robot that autonomously measures crop traits, developed at the University of Illinois. TerraSentia is being unveiled on Sept. 11 to 13 at the Ag Innovation Showcase in St. Louis, bringing agricultural innovators together with investors to help realize the future of the industry. The start-up company EarthSense, Inc. announced it has filed a provisional patent and is now taking pre-orders for the agricultural robot TerraSentia, which will be ready for the 2018 growing season. Developed at the University of Illinois, with support from the Advanced Research Projects Agency - Energy (ARPA-E), the robot will cost early adopters $4,999 – a fraction of the cost of hiring laborers to measure germination, conduct stand counts, and other monotonous jobs. The robot’s developer, Girish Chowdhary, a professor in the Department of Agricultural and Biological Engineering at U of I, envisions a fleet of these ultra-compact robots roving fields doing simple tasks that will free up precious human capital to work on the big picture. Currently, the robot can autonomously count plants and measure stem width to help estimate biomass for corn, sorghum, and soybeans. Work is underway to teach it to measure stem, angle plant height, corn ear height, leaf area index, early vigor, and biomass, and to identify diseases. Early adopters who order by Nov. 31, 2017, will get 100 hours of one-on-one consulting to teach their robot to detect and quantify other traits that drive their business or research. They will also benefit from an exclusive buyback program and a one-year, all-inclusive warranty. TerraSentia comes equipped with two visual cameras, a tablet app featuring first-person view, and secure cloud software used to store data and teach the robot. 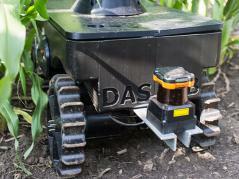 The ultra-compact robot weighs less than 15 pounds and is just 11 inches wide to fit in most crop rows. At 8.5 hours per charge, the robot’s battery lasts a full workday. The robot can be further customized with GPS to enable autonomous navigation and custom mounts for additional sensors including multi-spectral cameras, hyperspectral cameras, stereoscopic and structured light cameras, and LIDAR. For more information or to order TerraSentia, contact EarthSense, Inc. CEO Chinmay Soman via email at hello@earthsense.co or visit earthsense.co.